On 27th of April 2017 the annual Girl’s day will take place and many German technical enterprises and universities will open their labs and workshops for girls. Girl’s day – Future Prospects for Girls has been started in 2001 and aims at offering insights into jobs which girls often don’t take into account. About 50% of the NanoHybrids project team are female researchers, professors as well as PhD candidates. NanoHybrids would like to stimulate girls as well as boys to think about a career in the area of nanosciences. 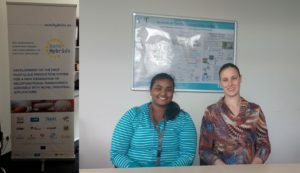 Imke Preibisch and Sheela Venkatesan talked to the NanoHybrids press office about their motivation as engineers. Imke, you are doing your PhD at TUHH at the Institute for Thermal Separation Processes, and you are supervising Sheela’s master thesis at the same institute. I would like to talk with you both about your work and what you like about your work. I am curious what you will recommend to school girls. 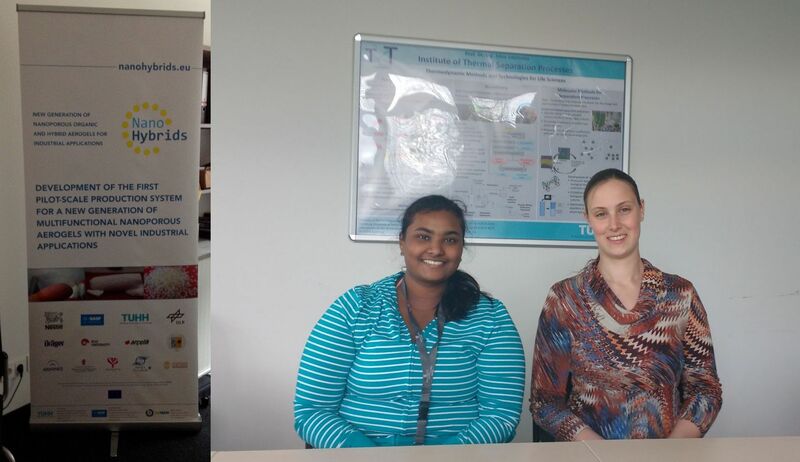 Let’s just start – Imke and Sheela, what are you doing here at the Institute for Thermal Separation Processes at TUHH? Imke: I am working as a research assistant and doing my PhD on the production of aerogels from biopolymers. Aerogels are highly porous solid materials, which are already used industrially in insulation applications. The interconnected porous systems provide high surface areas and we hope to enlarge the fields of their application. Imke, you are contributing to the European Nanohybrids project. How is this project related to your PhD thesis? Within this project we produce aerogels from biopolymers and inorganic polymers for different industrial applications. We optimize aerogel properties towards these applications and working on the scale up of the production process from lab scale to production scale. These results will contribute to my PhD thesis. What do you like about your collaboration in a European innovation project? It is great to work together with so many different industrial and research partners. We all work on a common goal but with different research and development approaches. You can exchange experiences and learn a lot. When did you start your PhD and when do you aim to finish it? I started two years ago, in April 2015. Hopefully my PhD will be finished in two more years, almost at the time as the NanoHybrids project. What about your work here, Sheela? I am doing my master thesis under the supervision of Imke and Ilka, as you can see – another female researcher. [Ilka Selmer also is a PhD candidate at the Institute for Thermal Separation Processes]. I am also working on one part of aerogel production processes. In October 2015 I joined the institute, first for one month as an undergraduate assistant. I’ll have to submit my master thesis on 14th of June 2017. Since when are you in Germany, Sheela, and what are you studying? I came to Germany in September 2014 to do my master studies on Chemical and Bioprocess Engineering at TUHH. Before that I did my bachelor degree in Chemical Engineering at MSRIT, Bangalore, India. What did you study, Imke? I studied process engineering at the TUHH. Since when have you been interested in science and technology? Imke: I do not remember. I think I was always interested in science. Since school I liked mathematics, physics and especially chemistry and I was always good at it. Sheela: I always wanted to be an engineer; no matter what kind of engineering. I then decided on chemical engineering as it offers so many different options. The basic stuff of chemical engineering is needed in almost any part of engineering; it’s just a good choice. In India everyone aims to study engineering. There are as many female as male students in engineering sciences nowadays. Also, in the 8 most prestigious Indian universities most of the top leading engineers are female today. But I fear there will be less jobs in the future for us as there are so many students in engineering now. Imke: I think we have been about 50 percent women in process engineering studies. Nevertheless, for some other studies like electrical engineering the rate of women is still low. Sheela: In India everyone – whether female or male – is doing electrical engineering; so why should I do that? Thus I preferred chemical engineering. Of course, in job advertisements of the chemical industry and petrol industry in India the first line still says “Male applicants will be preferred”. They say there is too much heavy lifting for women in these jobs. In electrical engineering and in electronics women have better job chances than in the chemical industry. Imke: This is different in Germany. This would not be possible in Germany. It is not allowed to prefer male or female applicants for a job. Sheela: In India they still prefer men, definitely and especially in petroleum companies. Such nice companies but so low chances for women to get a job. I am so happy to hear that many things have obviously changed since my studies in chemistry about 30 years ago. Women were very rare in technical professions in Germany and I had to live with a lot of prejudices against female chemists. Do you think there are still prejudices in Germany, Imke? I never faced such prejudice against women in process engineering. Furthermore, in Germany in the meantime, in areas like computer simulation female engineers have a better reputation. The only prejudice I faced during my studies was that women are more diligent than men and, therefore, have sometimes better grades. How would you rate the attitude towards female and male scientists in the NanoHybrids team? There are efforts from European Union to have high rates of female scientists and partners within the project. From professors to academic partners and industrial representatives about 50% are women. Further also many female research assistants do work on this project. I do not have the feeling that there are prejudices about women in this project. Let’s come back to the intention of the Girls’ day. Probably our readers are curious what inspired your interest in technology? Imke: I am not sure about this because I feel my interest has been there since ever. It was just fascinating. It was just normal. I think also teachers in school inspired this interest. My brother also studied engineering; my father was always interested in physics and there was always someone who could explain things which I hadn’t understood. Sheela: I always played with engineering science kits. I come from a family with a strong medical background. We have got many doctors or nurses in our family and I was the odd one out of them. Were there any girls in your class who liked science but did not dare to study it? Sheela: No, engineering is a well-paid job. Thus everyone is interested in studying engineering. But there are not so many people with my enthusiasm, my zeal and ambitions. We often needed a group of four to be promoted to an activity and mostly I needed to work hard to convince my fellow colleagues to join my applications. I didn’t see much passion. Imke: All my female friends with similar interests pursued their interests and decided on science, just as I did. Those who didn’t just were also interested in the other topics which they then chose. Sheela: Boys are still more present in competitions than girls. Imke: Girls often have to be really, really sure before they do something. Boys are still much more straightforward. But, I usually don’t think in categories of competition. I perceive TUHH as a place where we all work together and do not need to compete with each other. If you would be invited to do something new and challenging what would you do? Imke: I would say “Yes, I can do it” and then prepare this very carefully. Sheela: Me too. In India I would just jump into everything. Now I would plan more carefully. But that’s more a cultural thing than a gender thing. In Germany, I learned to plan more. MRR: It’s definitely good to know that things have changed and that it is much more natural now for females to follow their own path, independent from assigned gender attitudes. Imke: I am still open. I like to do research, I would like to work in industrial research, but I could also imagine to go into project planning. I think that sounds like a good plan. Usually engineering careers start in industrial research and then move forward to areas beyond research, e.g. project management, management etc. Imke: Yes, and the step back from project management to industrial research is still more seldom, it is perhaps possible but it is usually not planned in industry. Sheela: My next objective is to get into a PhD position; I have the impression that I need to learn much more before I can contribute significantly to society. Later it depends. What would be your favourite country to do your PhD, Sheela? I like Germany but German is a difficult language. Thus, I would prefer an English speaking host country for my PhD. On the other hand, in Germany I learned punctuality and the German approach to research is amazing. I have 90% freedom to do my research I just enjoy it. What would you recommend to a ten-year old girl who is interested in science and technology? Sheela: If you have the capability just do it! Imke: That’s what I also say: Do what you like and just try. Especially in school you have the opportunity to try many different things. And girls can also like mathematics and physics. And when you know that you like something do not let someone steer you inside something else. Talk to your friends, parents, and teachers about this. Do not be scared because someone tells you “you cannot do this”. Find out for yourself whether you can do this and then just go for it! Sheela and Imke, thank you very much for this interview. It was a pleasure to talk to you and I fully agree that chemical engineering on nanomaterials is fascinating and promising. I wish every success for your future career paths. Imke Preibisch has started her PhD at the Institute for Thermal Separation Processes in April 2015. In 2013 she was one of three winners of the Bachelor Prize awarded by the three companies DOW Deutschland, Hamburg Energie and GEA Brewery Systems. Already at school, she set her focus on Maths and Chemistry and was awarded the prize of the GDCh (Society of German Chemists) as the best of her cohort in chemistry. Since October 2012, she has been studying at the TUHH Master’s Program in Process Engineering at the TUHH, a Bachelor’s degree in the same field. Since 2003, she has been working as a child care worker in the church community of Neu-Rahlstedt, Hamburg and was also a tutor at the TUHH.